29 users are watching this product. Import, Update and Export to Excel, CSV and XML; DNN Users info, Password, Roles with effective and expiry dates, Profile Properties (including address) and Custom Profile Properties with this powerful utility. For DNN 4.5+, 5 and 6. Module customization available. Import and Export any Data from your database (single or multiple tables and views) using Visual tables selection, views selection, columns selection, table relationships and filters on columns. Export to Excel, CSV and XML. Export Username, Password, FirstName, LastName, DisplayName, Email, User Roles, User Profile Properties including address and contact info, and Custom Profile Properties. Export user roles with Effective Date and Expiry Date. Export: User Creation Date, Last Activity Date, Last Login Date, Last Password Changed Date. Sort any column in ascending order or descending order by clicking on column name. Page wise display of users. 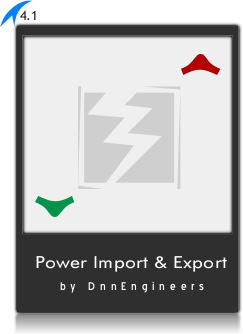 Option to Export Current Page Users. Option to Export All Users. Import and register users in bulk. Import Users with Password, Roles, Profile Properties including address and contact info, and Custom Profile Properties. Role created if not exists and user added to that role. Option to select/unselect columns in your data file. Option to map column from your data to any DNN Property column. Validation checks for required DNN fields and existing users. Colored display of errors and existing records in tabular format. Colored messages of 'successful' or 'failed' import with 'failure reason'. Message for displaying count of records imported out of total records. Export any data from any table or combination of tables from your database. Visually create relationships among tables. Visually select columns to export. Option for getting distinct records. Option to add & remove Columns and Table Relationships while working with same tables. Options for "Single Filter" and "Combination Filter"
Apply as many "Single" and/or "Combination" Filters as you require. Option for adding and removing filters while working with same tables and columns. Resale and/or redistribution of this product is strictly prohibited in any form or shape. Obtainer shall not claim intellectual or exclusive ownership of this product modified or unmodified. This product is provided "AS IS" without warranty of any kind, either expressed or implied. In no event shall we be liable for any damages including, but not limited to, direct, indirect, special, incidental or consequential damages or other losses arising out of the use of or inability to use this product.